Why would I need self storage in Matawan, NJ? There are a variety of reasons why you might need self-storage in Matawan, NJ. How much is a storage unit in Matawan, NJ? The cheapest storage unit in Matawan, NJ is $64.00 per month. What size storage units do you have available in Matawan, NJ? In Matawan, NJ we have sizes that range from 5'x10' to 20'x20' to suit your storage needs. How much is it for a 5'x10' storage unit in Matawan, NJ? The cheapest 5'x10' storage unit in Matawan, NJ is $64.00 per month. Matawan is a small New Jersey borough, located in northeast Monmouth County. It boasts scenic views of the Raritan Bayshore coastline, diverse residential neighborhoods and a rich maritime history. Matawan experienced many changes to become the city it is today. In 1857, Matawan Township was formed from Raritan. The area contained the cities known today as Aberdeen and Matawan. Early settlers named the town after Matawan Creek. After the Civil War, businesses and residents in the area needed a level of service that Matawan Township couldn't provide. In 1866, the state legislature created a special assessment district for maintenance, but even this district wasn't enough. The citizens of the area began advocating for incorporation. Yet on March 20, 1883, when a referendum to form the Borough of Matawan developed, a 93-79 vote defeated it. Undaunted, supporters tried again to bring up the referendum, on March 17, 1885. This time, the referendum was able to pass by a vote of 144-133, and the Borough of Matawan came into existence. In 1895, Matawan officially separated from Matawan Township. In 1977, Matawan Township changed its name to Aberdeen. Matawan locals benefit from the Bayshore Regional Strategic Plan, a joint-effort by nine communities in northern Monmouth County to boost the regional economy. Efforts have included revitalizing the traditional downtown areas, enhancing dense residential areas and reconnecting with the communities' maritime roots and natural setting along the Raritan Bayshore coastline. 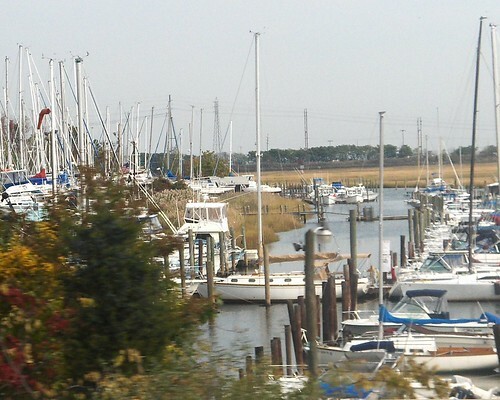 Although Matawan is more than 10 miles from the ocean, the Matawan Creek provides a coastal setting for the community. Certain portions of the creek are large enough for private boats, though sharks have sometimes been spotted in the waters. The community is also located at the northern endpoint of a portion of the Henry Hudson Trail, which spans a total of 24 miles and offers views of the surrounding woods, wetlands and fields. Matawan is also well-connected to major metropolitan areas like Manhattan, making it possible to commute to the Big Apple for work or leisure. Matawan-Aberdeen Regional School District manages the public schools of Matawan. In addition to the community's public schools, private schools provide an alternative education option. These schools include Minding Miracles Learning Center, Matawan Montessori Academy, The Goddard School in Old Bridge and First Friends Daycare. Utilities: Matawan energy providers include Jersey Central Power & Light and the borough utilities department. Garbage and Recycling: You can expect regular collection of trash and recyclables, as well as scheduled pick-up for yard waste and bulky items. Transportation: Matawan has earned recognition for its busy train station, which offers access to New York's Penn Station via the New Jersey Transit system. It also provides public bus service to the Port Authority Bus Terminal. Despite its convenient location and amenities, Matawan is reasonably priced for the region. The housing market offers plenty of options for both home-buyers and renters, so you'll be able to find something that fits your needs. Our lowest priced units in Matawan, NJ average $64.00 per month. 45 people have reserved units in Matawan, NJ in the past 30 days. There is 1 location within Matawan, NJ's city limits. There is 1 location in Matawan, NJ that offers AC and Heating features.